So I’ve recently (and finally) gotten back into playing Dungeons and Dragons. It’s amazing how much I’ve missed it. I really do enjoy the shared experience of telling a story together with a group of people. Since I don’t know enough people where I am who play D&D, once I made my decision to start again, I had a look around for an Adventurers League group. Fortune smiled upon me, since it turns out that there was a group nearby that was just starting its run of the newest adventure from the folks at Wizards of the Coast, Storm King’s Thunder. Registration was opening soon, and there was a limit of about 20 people to play. Naturally I made sure I was there in plenty of time to ensure I had a seat. In this case, that was being there about 4 hours ahead of schedule. And boy am I glad I was there early. I think there was about 3 people ahead of me in the line, and within the hour, all the available spots had filled right up. Of course, since I’ve also started putting out new content on my crafting channel, it seemed like an appropriate theme for me to tackle for some new content. 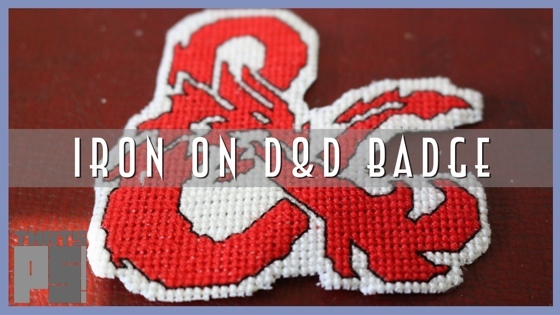 So I’m starting off part 1 of a two part set of videos by creating an iron on D&D logo badge. I’ve got something specific in mind for me to put it on, but it’s something you can use on pretty much anything, assuming your anything has about 3″x3″ amount of space to iron on the badge. If you’re looking to make this, but don’t know how to cross stitch, I’ve put up a cross stitch basics video as well to get you started. I’ve been doing this for at least 25 years now, and I doubt I’ll ever stop. It make take a lot of time to finish a project, but I’m always happy with them when I’m done.